Before there was Miller Park and Bernie's Dugout, there was Milwaukee County Stadium and Bernie's Chalet. 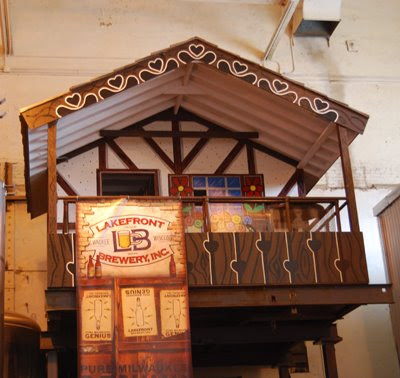 Home of the Brewers' mascot during his time at the stadium, the chalet now resides at Lakefront Brewery, where you can see it on the tour. His famous giant mug of beer is also here. After last night's extra-inning win, I'm sure Bernie would have loved to take an old-school slide from the chalet into that mug. wOW I never knew that! Thanks for the info! The glow makes it look so warm and inviting!